liveSite is a back-end website engine that can drive any front-end website design. Import your entire existing website and any custom responsive HTML design, so you’ll never have to compromise the look of your website for the sake of your website platform again. Every liveSite starts with a complete website template ready to go, so you can quickly remove the site areas you don’t need instead of taking the time to learn how to build them. Every liveSite starts with a fully-responsive front-end theme so you can start creating pages and adding content without the need to create a website design first. At any time you can replace the default site design with your own design. It can be real hassle to migrate to a new website platform. You might have hundreds or thousands of pages, images, and document files within your old website. liveSite import feature will scan your existing website and import all your content and files with the click of a button. Import any responsive website or purchased template, it's digital assets, and design files with a click of a button. Then you can make quick work of connecting your web pages to liveSite's back-end functionality using simple HTML tags. Front-end designs can be used to “skin” any area of your website so you can have one design for your public website areas and a totally different design for your many portal areas. Creative Style Guides are welcome here. Add your own Custom Formats and restrict the use of fonts and colors so your content editors will be forced to add content that has a consistent “look and feel” across all pages. Upload all your digital assets, photos, and code files using drag-n-drop or by importing them in a ZIP file. Edit code files and images in place on the server without the need for FTP or any other desktop design software. You can upload one or many files with drag and drop ease. Zip files are automatically unpacked for you too. Edit your markup and code files from within your web browser and see an instant preview of your changes across all devices. No need to FTP files back and forth to the web server every time you need to make a change. View, test, and share your design updates with other users across your production pages, without affecting your site visitors. There is no need for a separate development site. Create any number of responsive HTML page layouts for one or many pages. You can even create Page Styles for your newsletter pages that are sent using the built-in email campaign feature. Add HTML/JS/CSS code to any page or group of pages so you can edit the code in one place and it will be inherited by any number of pages. Add PHP code to your pages in the special case where you need to push or pull data from another application. Add your responsive navigation as unordered HTML lists and your content editors will be able to edit the menu without the need to access your HTML code. Built-in animated sliding and rotating banner areas provide your content editors with an easy way to stack, slide, and fade them on any page. No software or servers to manage or monitor. That’s our job. You get instant access to visitor trends, the most recent site updates and activity across your site as soon as you login. Every hosted liveSite is monitored 24/7/365 by our proprietary monitoring system that continually watches for and clears server traffic jams and protects your site from spambots and malicious postings. We have over 60 probing servers located around the world that test your website each minute of every day to ensure it’s up and running. If it’s not, our server team is alerted instantly to begin resolving any issues. We provide free software updates for all Hosted or Managed customers. with new feature enhancements and fixes applied to your liveSite automatically, you are always running the most current version. We backup your entire liveSite on a daily, weekly, and monthly basis to ensure you never have to worry about data loss. Since we maintain several backups of your website, we can restore your entire liveSite, or just a portion of it quickly if the need arises. Through the use of the newest browser techniques, caching, CDNs, and parallel requests, liveSite is massively optimized for speed. Even with hundreds of thousands of data points coming together on a single page - it’s almost instantaneous. Get instant access to visitor trends, the most recent site updates, and the most recent site activity across your entire website as soon as you login. Analyzing your website traffic is easy. With Google Analytics now built into liveSite, just enter your Google Analytics Tracking ID and all your pages are tracked automatically. Again, no coding, and no worries. Google Analytics provides most of the site visitor data you’ll need. But for questions like: “What email campaign brought them to the site?” or “What form did they submit”? or “Did they start and order and abandon it?” you can create your own Visitor Reports for answers. Track all site changes in real-time based on User and IP address so you will always know who changed what. liveSite is designed around data security so not only are your transactions encrypted, but all your content and login transmissions are too which is not true of all popular web platforms. Having trouble with fraudsters or trolls interacting with your site? No problem. We show you their IP address so you can block an IP range of a signal IP address quickly and easily. We block their forms, comments, and orders gracefully so they don’t even know you’ve blocked them. Add unlimited member and client portals, and delegate every aspect of site design, site content, and site management to your staff using amazingly flexible access control. 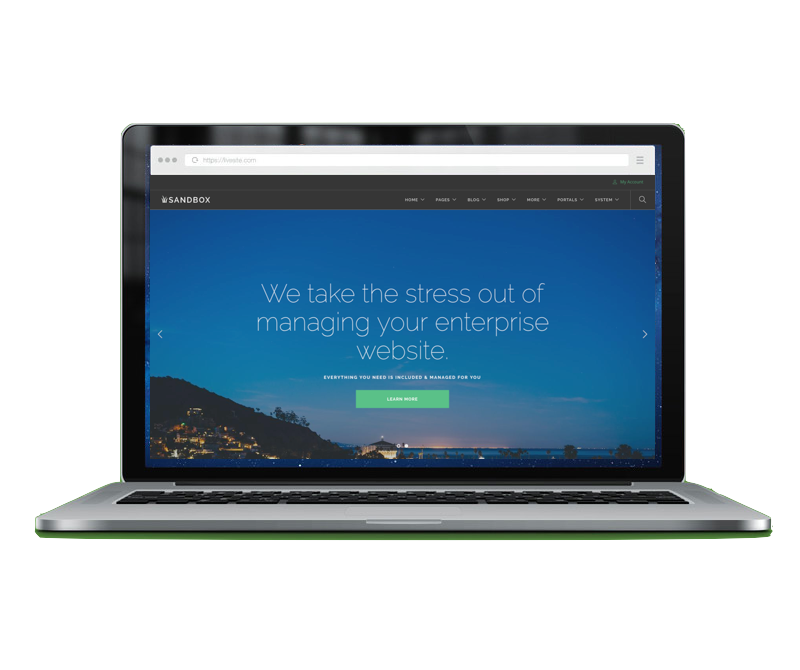 Unlike most enterprise website platforms, liveSite allows for an unlimited number of Users so you can grow your site without growing your cost. Add a visible badge next to the display of any username. Badges are great to identify or differentiate posts and comments made by special groups of users on your website. Manage all your bloggers in one place with unlimited blogs. Restrict blogs for different audiences if necessary. Create secure micro sites within your website and even redirect users automatically to their micro site when they login. All guests, customers, members, subscribers, staff, and managers can change or retrieve their password at anytime. If enabled, liveSite can remember the user’s username and password on returning visits from the same computer. Upload and create User accounts and assign privileges automatically from a text file, or spreadsheet. Integrated CMS features empower your staff to create, publish, and update website content easily. Site maps, tag clouds, full-text search, and SEO metadata are all updated in real-time. Using any popular web browser, your staff can update website content, features, and create reports from their office, home, or on the road. The integrated content management system allows you to delegate, create, publish, manage, secure, and update website content and media easily. Browse to any web page you have edit rights too and edit content right on the web page. Crop, re-size, rotate, colorize, and compress your photos and images without leaving the web page. liveSite includes a full-featured word processor that makes it easy for anyone to add text, photos, and links effortlessly. The new editor is nicer looking, faster, provides full support for all the most popular browsers. Upload and play audio or video from any page on your website, or embed video from any online service like YouTube, Vimeo, etc. Create unlimited web pages and connect them to each other to create powerful workflow apps. Create page layouts and use them for landing pages or across any area of your website. Mark pages and files as public, or restrict access to any group of users like your staff, customers, clients, members, project teams, or even a specific individual. Sitemap.xml file checked by search engines is generated automatically for your entire website for faster listing in the search engines and to improve your site ranking. liveSite automatically submits your sitemap to various search engines when necessary. You can also edit the sitemap.xml file, as well as your own robots.txt file. This feature allows you to perform A/B market testing, or just keep your website interesting to frequent visitors by rotating several home pages. Create landing pages for your email campaigns, product announcements, affiliates, and click-thru advertisements. Unlimited page areas and menus can be created and shared across several or all web pages. Securely share files with your staff, members, customers, or guests, allowing them to view or download the files from their own location. Create unlimited folders to place pages and files to secure them for specific audiences. Built-in security prevents unauthorized access from deep-linking. Create unlimited photo galleries for everyone to see, or restrict viewing to specific audiences. Use the optional Photo Album feature to allow your audience to navigate multiple Photo Gallery collections from the same page. Create galleries where you're visitors can browse or search videos and other rich media - just like YouTube.com, but without the unwanted ads. Add rotating ads into your website designs to create animated home page banners, presentation slides within pages, or traditional rotating ad images and content anywhere on your site. Requires no Adobe Flash technology so it works on all mobile devices. Post current news and information to your website, intranet, or extranet and have it expire automatically after a specified period of time. Allow visitors to search your website pages and even inside your file attachments. Only page and file content that the visitor or user has access to will be displayed. Content editors can even specify which pages and products are included in the search results and in what order. Add Tag Clouds to expose searchable content and make it easier for visitors to find related content. Any Page or File can be archived. Archived pages will still be available to Content Managers, but not to any other visitor to the page. Create custom web forms to gather information securely for any reason, including event registrations, custom product purchases, trial memberships, and even online quizzes. Create unlimited web forms and embed them into any page to create interactivity and gather data throughout your website. Simply point and click to build custom web forms to capture data into your secure liveSite database. Add workflow and required fields to your web forms. If you are collecting sensitive personal or financial information, you can encrypt web forms. Allow users to edit only their own submitted form data through your website. This is ideal when you are creating a directory page and you want each registered user to create and update their own directory entry. CATPCHAs can be difficult to complete and turn away site visitors. Our simple CAPTCHA is easy and quick to answer, and only displayed when necessary, while still providing an impenetrable defense from SPAM for your site forms and comment fields. Connect any web form to the contact database to automatically pre-fill form fields and update the contact database automatically when a web form is displayed or submitted. E-mail links to downloads, instructions, directions, or simple “thank you” notices automatically after any form has been submitted. Allow site visitors to submit web forms, or make certain web forms available only to your staff, customers, members, or even a specific user. Restrict access to any set of collected form data. Create custom data views for users to browse or search. Each view can restrict specific fields from display and the data views can be protected in secure Folders or to specific users. liveSite tracks every user interaction and automatically updates contact information and mailing lists, so you can effortlessly send timed e-mail campaigns to any user or audience segment. The integrated contact database is populated and updated automatically for you as your site visitors interact with your website. There is no limit to the number of contacts you can store in your database. Organize your contacts into any number of Contact Groups and liveSite will keep them automatically as users interact with your site. Create unlimited mailing lists and assign list management and e-mail broadcasting privileges to specific Contact Managers. Open any Contact Group to subscribers so they can add and remove themselves from specific mailing lists at any time. Create e-newsletters, promotional message, and alerts, and broadcast to unlimited mailing lists. Mail merge including duplicate addresses and opt-out requests are handled automatically. Send predefined e-mail campaigns to individuals based on actions they take on the website such as submitting a specific form, purchasing a specific product, or registering for a specific event. Auto campaigns can also trigger other auto campaigns (called 'drip campaigns') so you can setup your marketing campaigns and "set it and forget it", leaving liveSite to do all the work. Keep your presence known by broadcasting full color HTML e-mails with clickable menus, links, and photos. You can also indicate that you want to send text-only messages instead if you have a mobile or low-fidelity user base. Tracking codes are automatically added to any e-mail campaign you send so you can track recipient actions and any orders they place. Attach memorable aliases to any page so your e-mail campaigns are easy to remember and manage. Filter and export contact groups into a text file or spreadsheet. Create members-only areas within your website. Members can pay for access, sign up for a trial, or register using a security code you provide to access privileged content for a limited time. Unlike most membership management solutions, liveSite allows you to manage all your members without any additional cost. Create members-only site area where members can login and securely update their contact information., purchase items, and renew their subscriptions. Put your membership directory online and protect it behind a login so that only authorized members in good standing can access or update it. Import your existing membership database using a simple text or CSV file, including existing membership number and any expiration date. Grant trial membership access through any Web Form. Members can purchase instant access to membership areas that can expire automatically after a certain period of time. Allow existing members to create a website account using their existing membership number, or let your website automatically create a new membership number and account for them when they sign up for a trial, or purchase a membership online. Automatically e-mail a renewal reminder message to any member when their membership is about to expire. Members can pay for their renewal dues and their access to Members-only features will be reactivated automatically. Automatically expire members access after some period of time, or if payment for recurring dues are not collected through the Website Payments Pro gateway. Discussions can be enabled on any page so your users, members, staff, or any other group can communicate securely within their own private space to provide feedback or build consensus. Create unlimited blogs so each staff member that needs a voice can post to their own blog and moderate comments. Create unlimited forums within your website, control access to each of them, and provide the convenience of single-login for all forum participants. Build community throughout your site by allowing comments to be posted to any page. Great for providing feedback before publishing a page, or to allow visitors to post responses and reviews to articles, media, forums, products, or calendar events, to mention a few. Comments can be published immediately or approved first. You can decide whether visitors must login before they can add a comment, whether they can remain anonymous when posting, and even enable or disable new comments on any page at any time! To prevent SPAM, anonymous Comments are CAPTCHA-enabled automatically. Anyone can receive an e-mail alert whenever a comment is posted. This is useful for notifying those interested in receiving updates from a forum thread, a blog, or any other page where comments are enabled. Complex database URLs are automatically replaced with clearly labeled links so search engines can effectively crawl your public pages and better rank your website. Improve visibility with Search Engines by adding specific meta tags to any page individually, or use site-wide defaults. All calendars, blogs, forums, and any other public data view you create are RSS-enabled so your site visitors can subscribe and get updates without visiting your site. Update your Facebook page or Twitter feed automatically when you post to any of your blogs. Share your content with Facebook, Twitter, Google +1, LinkedIn, and dozens of other popular sites. User badges are a great way to build trust within your online communities. Create public calendars for visitors, or protected calendars for any group of users so they can quickly find event information, reserve a seat, or purchase a ticket. Create calendars for your website with complete control over who can update them and who can view them. Calendars can be displayed as 'month at a glance', 'week at a glance', or only 'upcoming events'. Calendar layouts are responsive so the appropriate layout is displayed based on the computer or device viewing it. Past events can either roll off the calendar immediately or they can be unpublished after a certain number of days so older events don't confuse visitors. You can assign any user with access to manage their own area calendar so you don't have to rely on a single person to manage all organization events. Events can be drafted by any authorized user you specify, but only published on the calendar by the Calendar Manager. Each published event contains an iCal link so visitors can instantly download and add the event to their own personal calendar. Add event notes that are only visible to facilities personnel that need more information to setup the venue for each audience. Attach products to calendar events to allow site visitors to pay to reserve available time slots in the schedule (think booking training sessions or office visits), purchase tickets to events, or reserve an available spot at your next private event. liveSite can process payments for almost any type of product, service, event, fee, or donation. And liveSite doesn't add any transaction fees on top of your own payment gateway. Personal payment information is always encrypted, and not even stored on your web server after the transaction is processed through your payment gateway. Take orders online for any type of product. Add unlimited product catalogs and unique checkout processes for each audience. Collect one-time donations or let donors schedule recurring donations themselves. Capture unlimited payments securely for products, services, tickets, registrations, and reservations. Offer downloadable goods such as software and eBooks. Once ordered, a link to the protected downloads can be send via e-mail automatically. Sign up students for your classes and charge them a fee. Limit the number of seats available, and allow registration to occur even after the first class has begun but before the course has concluded. Offer ticket sales for any event. Chose to sell all the tickets you can, or limit the number of tickets available for the event. "Buy Tickets" link is removed automatically when the event is sold out, or if the event has already begun. This feature even works for recurring events too, each having their own inventory of tickets! Allow customers to book and purchase your time, tables, rooms, facilities, rental properties, etc. Show your customers a calendar with date and times available. Add block-out dates or times. And when they purchase a specific time period you define, it becomes unavailable to others in real-time! Allow your sponsors to securely contribute to any fund on a one-time basis, or allow them to set their own recurring contribution schedule using their credit or debit card. Products can be displayed on order forms in many different ways. Link any number of order forms together to guide customers through specialized order processes. Nest any number of product groups together to make it easy for your customers to browse through your products. Create multi-media product catalogs to enrich the shopping experience for your customers. Built-in RSS capabilities to Catalog and Order Form Pages so visitors can subscribe to changes in your Catalogs, Product lines, or even down to a specific Product. This feature also makes it possible to automatically import your ever-changing catalog on a continuous basis into other systems like Google Merchant Center. Create unlimited products for any type of online transaction. Create more exposure for your products by rotating new and featured products within your catalog pages. Create unlimited simple or complex secure shopping carts, orders, donations, payments, and checkout processes easily by linking pages together. E-mail personalized quotes that can be updated by both the customer and your sales team and can be purchased by your customer online. Allow your site visitors to display your prices and fees in their own currency. Even automate conversion rate updates over the Internet. Set the base currency for all products pricing to any local currency so your transactions are processed without currency conversion fees through your payment gateway. Create discounts for preferred customers or to move certain products. Special offers can be based on offer codes, products, quantities, key codes, or date ranges. Specify whether the "best" available offer is applied or all matching offers are applied to any order. Verify billing and shipping addresses in real-time with the US Postal Service database during checkout. If you commonly ship products to physical addresses that are not easy for your customers to know (e.g. campgrounds, military bases, delivery stations, etc. ), you can display a list of any number of locations for them to pick from, and pre-fill their shipping address fields with the correct mailing addresses. Collect special delivery instructions or other custom shipping information during checkout. Billing and shipping information is pre-filled automatically for returning customers to make reordering quick and simple. Create custom web forms to collect specific fields when a product is ordered. This is ideal for fee-­based registrations or for any type of event or service. Add search engine meta data to your product pages and catalogs to enhance your visibility and ranking with search engines. Feed your product catalog data automatically into Google's Merchant Center. This means that your products can be listed, along with photos and pricing, to be found by anyone using Google's Shopping Search. Sell tax-exempt items and manage orders from resellers, non-profits, or individual donors. Payments are deposited into your bank account automatically through a realtime secure gateway after the purchase card is checked for fraud and available credit. The most popular payment gateways are supported including Stripe, Paypal Express Checkout, PayPal Payments Pro, PayPal Payflow Pro, Authorize.net, Clear Commerce, First Data Global Gateway, and Sage Payment Solutions. Allow your customers to purchase your products and services using their PayPal account. All customers and sponsors are required to agree to your terms before their order is processed. Display a customized order receipt and optionally email product-specific information for each product ordered. E-mail links to downloads, instructions, directions, or simple “thank you” notices automatically after an order has been placed. Specify an e-mail address that will receive an email copy of any orders that include a specific product. Create order reports and share them with others. View sales commissions by affiliate. Import and export unlimited products. This is great for importing your product from another database or spreadsheet, or making mass price changes to all your products at one time. Manage inventory levels for all products and services. When the inventory is gone, you can decide whether a customer can backorder the product, or see a customizable "out of stock" message and disable product ordering. Sign up sales affiliates to drive traffic to your web store using the built-in application and approval process. Different commission rates can be set up for each affiliate and/or product. Now with advanced reporting and accounting workflow. Customers and Affiliates can update their contact, billing, shipping, recipients address book, e-mail preferences, and password at any time. Customers can easily return to your website and retrieve saved carts, incomplete orders, or unprocessed donations. Customers can return at any time and view past orders and reprint receipts. Allow your customers to track shipments from within liveSite. Tracking codes from major shipping carriers like UPS, FEDEX, and USPS are automatically detected and linked to their package tracking websites. Supports split order tracking, or when multiple shipments are required for a single order. Customer can return and quickly reorder products and services. A personalized address book is created for each customer so previous recipient's shipping addresses can be recalled instantly. Affiliates can login and track their sales commissions in real time, and now supports recurring commissions. Track results from your paid search engine advertising and compare pay-per-click vs. organic referrals. Collect any type of data and display through secure and personalized views. Sync with user data, update custom databases, and trigger autoresponders and future e-mail campaigns. By assigning Page Types to your pages and connecting them together, you can add data-driven, interactive features to your website. You don’t have to know application or database programming. Display data on any page to create custom data reports for specific audiences or specific users. Add any type of directory page to your website, including photos and contact information. Connect pages together to create custom registration or order processes. Trigger third-party web services whenever certain web forms are submitted or orders are placed.